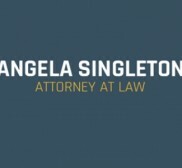 Angela Singleton is an experienced trial attorney focusing on Criminal Defense in all counties and Federal Court in Oklahoma. Angela is a skilled attorney representing Oklahoma City clients who have been charged with drug possession, DUI, murder, homicide, sexual assault, domestic violence, and other criminal behavior. Being charged with a crime can be scary, confusing and frustrating. You need attentive and aggressive representation. I will listen to you and put my extensive legal experience as a former prosecutor and trial attorney to work in your case.